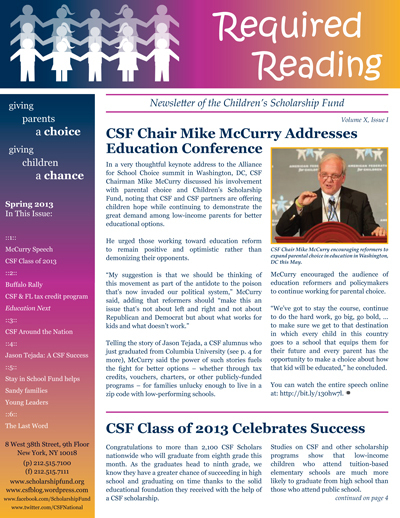 The Wall Street Journal just published a letter to the editor from CSF Chair Mike McCurry and CSF President Darla Romfo in response to the paper’s recent editorial about the late Peter Flanigan’s education reform legacy. New Jersey Governor Chris Christie was presented with a Citizen of the Year award at Children’s Scholarship Fund Philadelphia’s (CSFP) annual Student Award Ceremony this morning. 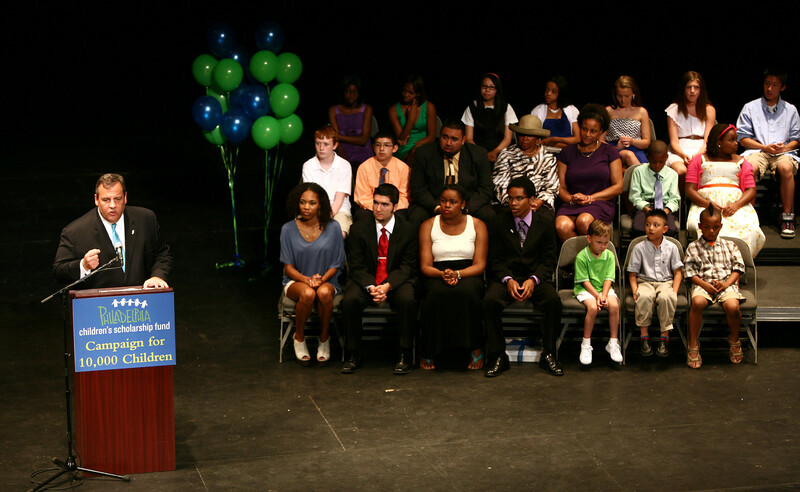 Governor Christie told the audience of CSFP Scholars, their families, and CSFP supporters that he wanted to accept the award in person because he believes it is important to put parents in charge of their child’s education. 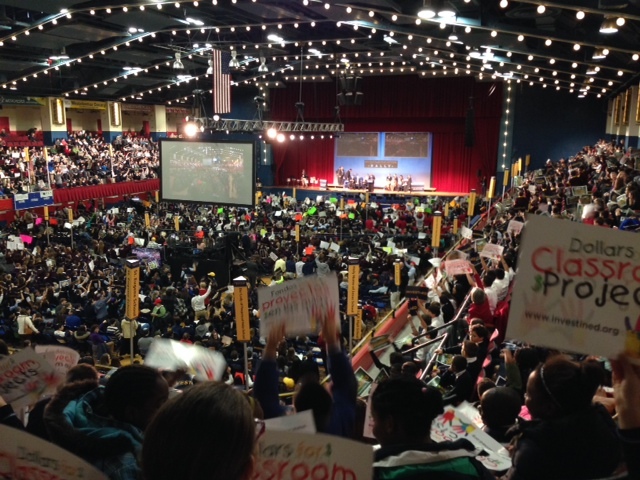 CSFP, a partner of the national Children’s Scholarship Fund, provided scholarships to 3,500 Philadelphia children to attend private schools in 2012-13. 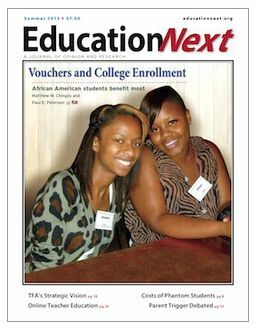 We are proud to report that the cover of the latest issue of Education Next features two Children’s Scholarship Fund (CSF) alums, Denasia Watts and Tiffany Williams. 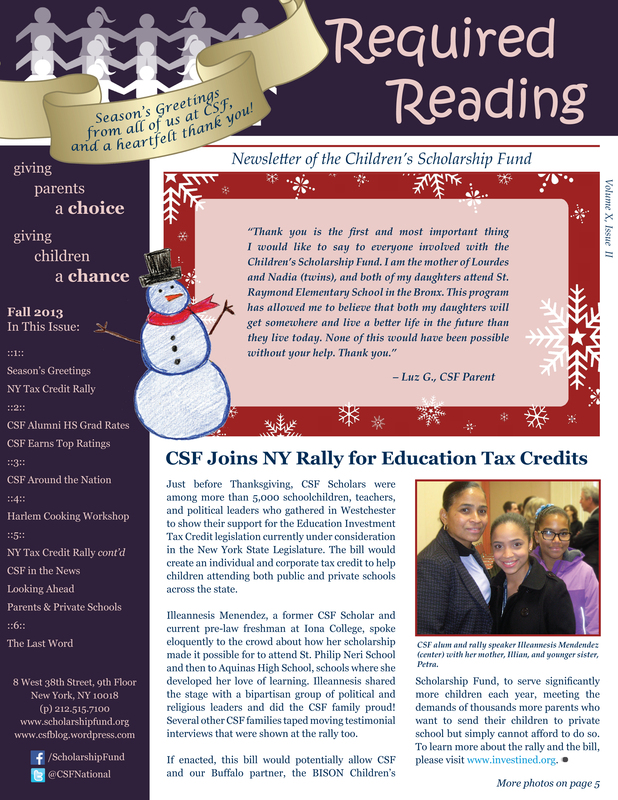 Both young women used CSF scholarships to attend private elementary schools in New York. Denasia will graduate from high school next month and plans to begin college this fall, while Tiffany has earned a bachelor’s degree from Temple University. Inside the journal, photos of several more CSF alumni accompany an analysis of the recent study from Matthew M. Chingos and Paul E. Peterson which found that African-American students who used scholarships to attend private school were more likely to enter college than their peers at public schools. 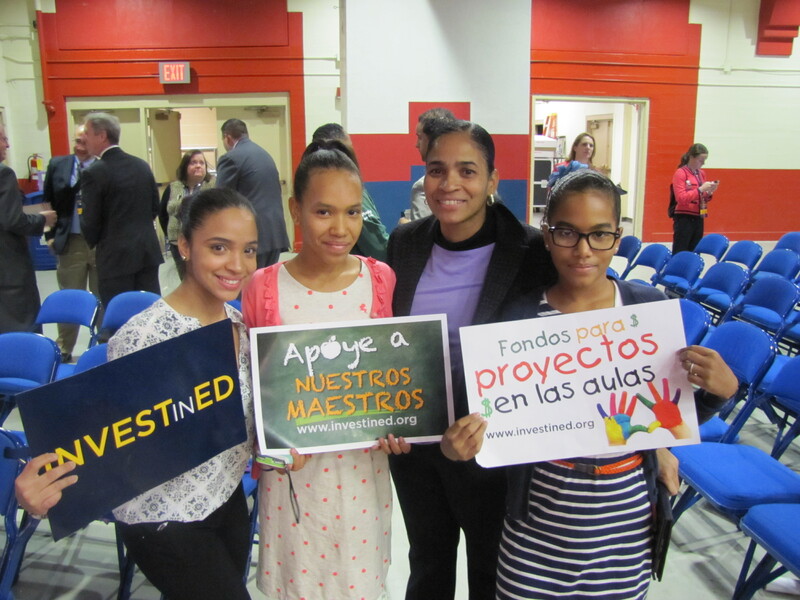 You can read the cover story online at http://educationnext.org/the-impact-of-school-vouchers-on-college-enrollment/. This morning, CSF Chairman Mike McCurry addressed the Alliance for School Choice summit, discussing how he came to be involved with Children’s Scholarship Fund and parental choice. He urged education reformers and policymakers to remain above the fray and focus on the positive stories of children and parents who are helped by scholarships and choice programs rather than demonizing opponents of choice. Telling the story of Jason Tejada, a CSF alumnus who is graduating from Columbia University this week and starting a job at J.P. Morgan, McCurry said the power of stories like Jason’s give energy to fuel the fight for better options for families unlucky enough to live in a zip code with low-performing schools. McCurry also called for an increased emphasis on the quality rather than quantity of choices available, noting that not every charter school or private school is high-performing. However, he remained optimistic and encouraged the audience to continue working for parental choice. 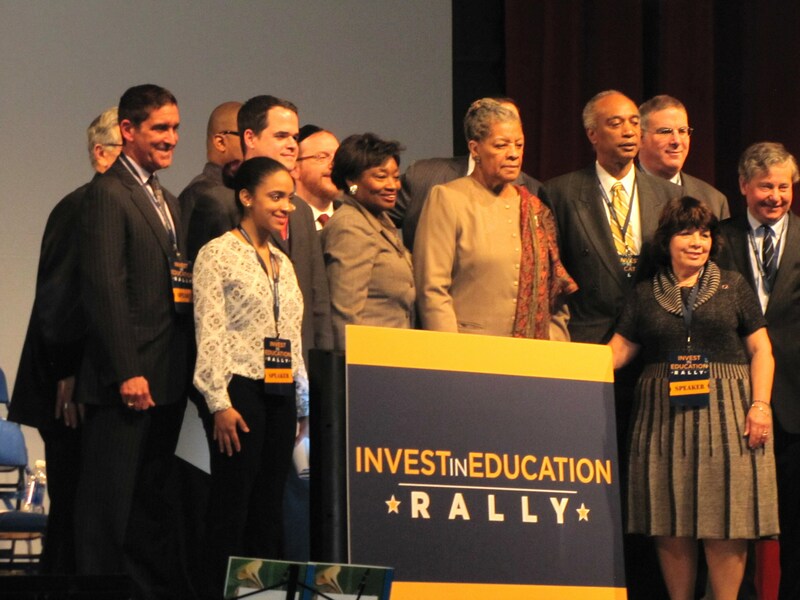 “We’ve got to stay the course, continue to do the hard work, go big, go bold, …to make sure we get to that destination in which every child in this country goes to a school that equips them for their future and every parent has the opportunity to make a choice about how that kid will be educated,” he concluded. You can watch the speech online here and read more from Redefined’s blog here.